Well I have a day dress. I’ve only ever had one day dress before so this is a new experience for me. And while it isn’t perfect, I like it. Unfortunately, I don’t have any good photos of completed dress:). Looking at the photos, I actually think it may be a little big. I am sooo afraid of making things too small that I think I err on the side of making them too big. What do you think? Too big? I cut a straight size 18 but I increased the size of the neckline, which also meant I didn’t need any kind of closure (although that wasn’t why I did it). And I won’t do it the same again. I will still increase the neckline slightly but not this much. I also think it has affected the hang of the dress plus it has reduced the visual impact of the upper bodice pieces which in turn affects the proportions of the colour block. Especially since I added the extra length (sorry can’t remember exactly how much) to the lower piece. I should have spread the increase proportionally over all pieces. This will also lower the bust darts, which it needs. 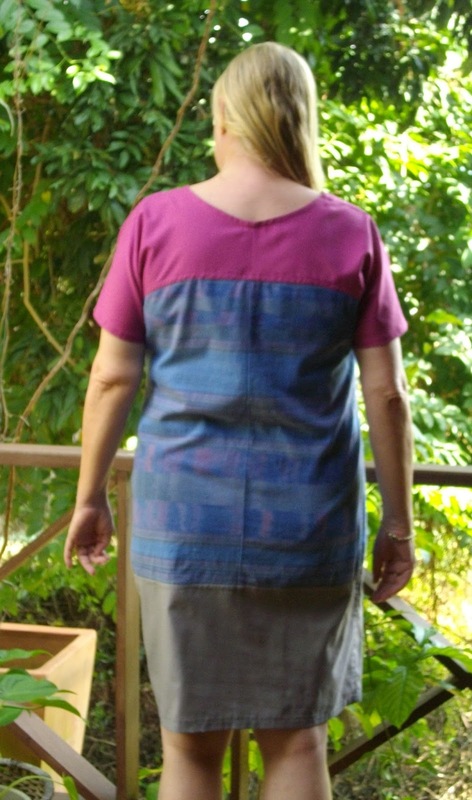 It has a CB seam from the original maxi skirt I used. 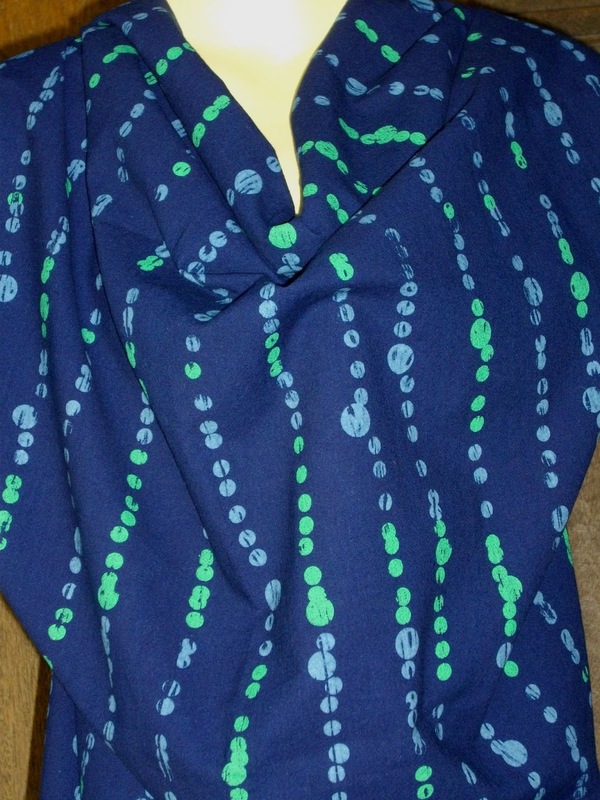 I had wanted to make the ‘stripe’ of the fabric vertical but there was a faded fold mark in all the wrong places. Hence, keeping the CB seam which also has a tendency to buckle a bit because it is quite thick. I also think the colour choice for the lower piece is wrong. Either a darker grey or a dark blue would have been better I think. It would have anchored the bottom better. I also did a completely incorrect forward shoulder adjustment. Instead of starting it at the seam line, I started it at the fabric edge. This completely threw it out. But it is really well finished (which I of course didn’t photograph). It has flat felled seams everywhere. And maybe if I’m feeling brave I’ll cut a size 16 instead, which of course will probably then need a different set of adjustments. Instead of contrasting colours, I am going to run the ‘stripes’ horizontally on the upper bodice and lower panel, with verticle ‘stripes’ on the middle piece. So what are your thought on the dress? Too big? Hi Gaye, I am not sure that the dress is too big, although like you I tend to err on the side of caution and cut large as well. 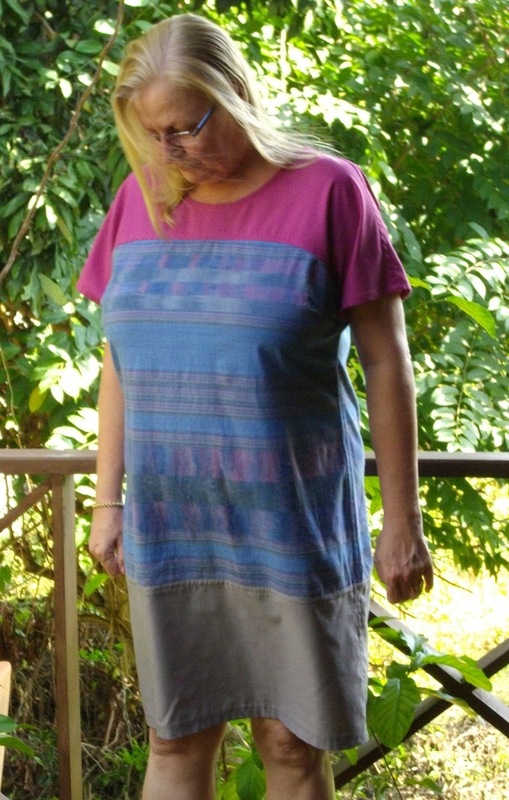 I think as this is a straight dress and woven, you do need quite a bit of ease. Also, I think in a humid climate, it is better to have something looser than something skin tight. Hi Gaye, the dress looks lovely to me. Great for your climate. I don't think it's too big. It looks just right to me. Thanks Sarah Liz, you're right. It does need the ease and when it is hot and humid it should be very comfortable. The size looks pretty good in the pics. Maybe you could try cutting out a size in between the 18 & 16 and see how you go. Or cut out a 16 & add a little extra side seam allowance just in case. That's what I tend to do when I'm not too sure if something is going to be big enough. Much easier to take a little off the side seams and err on the side of caution then to make something thats too small. I've had my fair share of doing that in the past LOL. I love the look of closely fitted garments but just don't find them comfortable to wear unless it's a woven stretch or a knit fabric. Thanks Adele. I know I was surprised with how mcuh fitting was involved in Sarah Liz's shift a month or so ago. I think she had a sway back issue too so good luck with that. I'll look forward to seeing the dress in that gorgeous green fabric.